My pressure waves started on Monday, May 22nd, in the late evening. I had seen the doctor that morning, had my membranes swept, and was still 1 cm dilated with a soft and thinning cervix. That night, I was sure my waves were just practice, so it took me a while to think to make use of my Hypnobabies tracks. Once I did, I was so so comfortable. My waves were maybe 6-10 minutes apart all night, but I was so comfortable, I was still convinced it wasn’t my birthing time. So on Tuesday, I went to work! My waves continued 8-15 minutes apart. I left work early because it was getting difficult to teach through each wave. I continued with my Hypnobabies tracks while at home and my waves got a little closer, but still incredibly comfortable. I showered, napped, and did a little cleaning, and by around 1 am on Wednesday, called the hospital to see what they thought. My waves were getting closer but were only 30-45 seconds long. I had planned to only go to the hospital when I had waves lasting a least a minute long and occurring every 4 minutes. We ended up heading in, me still with the expectation that I would be maybe 3 cm dilated and sent home. I was so shocked to get there and find out I was 7 cm dilated with bulging waters. The triage nurse had to bring in a second nurse to confirm. We got settled into our room and I continued using my Hypnobabies techniques through each wave. I found it necessary for my husband to put his hand on my shoulder and use the Relax Cue. I was able to breathe “Peace” or “ahhhhh” through each wave. At this point, I still wouldn’t describe any of what I felt as “painful”, though the intensity of each wave did require my full focus. They checked me again at 8 am and I had progressed to 8 cm, but with my membranes still intact and the good amount of amniotic fluid I had, baby was having trouble putting sufficient pressure on my cervix. We decided to break my water at 9 am to encourage progress. Mentally I knew this would increase the intensity of my waves, but I was completely thrown off by how powerful that first wave was. 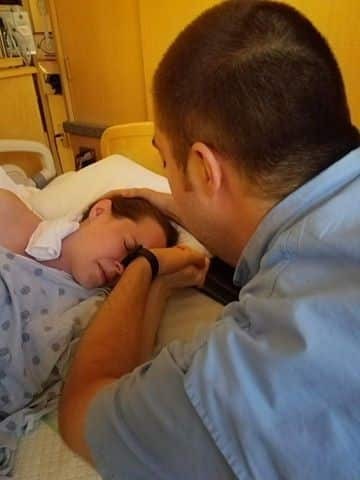 Once I made it through and shed a few tears, my loving husband was able to calm me down and remind me that each wave was bringing our baby closer and that we were so close to having him with us. I found that I lost focus of my Hypnobabies tools, so I ended up using their coached pushing suggestions. This, combined with the size of our baby and relative speed with which he came out, made the pushing phase much less than enjoyable. Even so, within 30 minutes, our baby had entered the world. At first, I felt a little disappointed that I had failed to use my tools right at the end, but the nurses (bless their hearts) were nothing short of impressed. I found that I really enjoyed the Birthing Day Affirmations and Easy First Stage track. I listened to those two tracks almost exclusively, and I found they said exactly what I needed in each moment of my birthing time.